My sincere thanks to those brave people who visited my garden on the rainiest day of the year. They reinforced my belief that gardeners are a hardy lot! 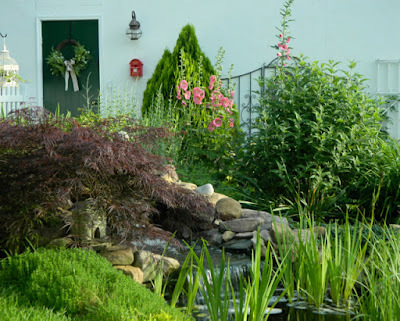 It began to rain at my house at 7:15 am just as I was deadheading the miniature roses and making some final touches, and it didn't stop until mid-morning of the next day. 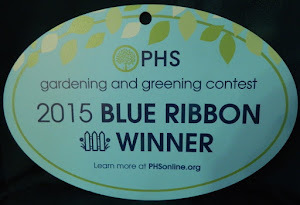 It was very disheartening after all those weeks of hard work: composting, mulching, weeding, and planting. Visitors, with raincoats and umbrellas dripping, arrived in ones and twos, but no more than a dozen in all. I am so glad the tour organizers are trying to reschedule the event. There were six gardens on the tour, and I am sure the other gardeners feel the same way. I took some pictures a couple of days ago to post on Facebook, hoping to tempt some of my 'friends' to come on the tour. I am so glad for those photographs as it was impossible to take pictures in the rain. 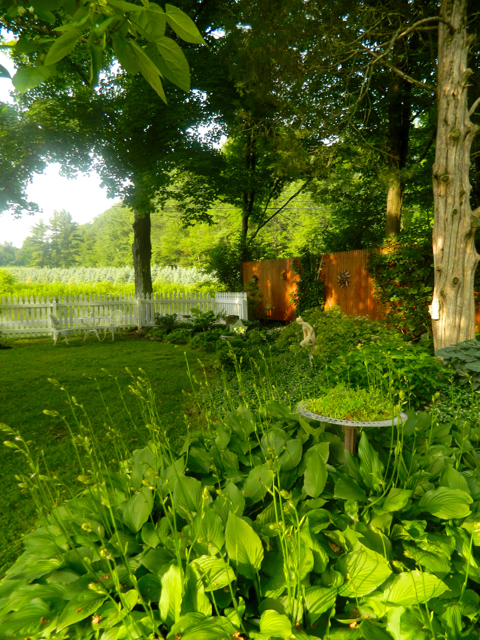 Come take a virtual tour with me. It is raining again, but you don't even have to get wet this time. 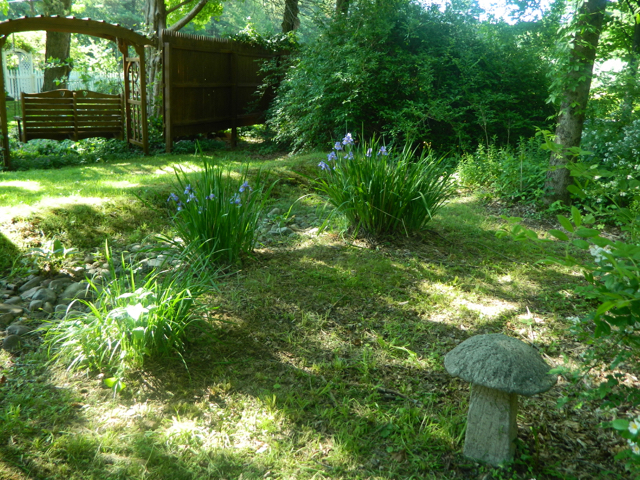 As you enter our property the purple cone flowers are coming into bloom in the small butterfly garden. 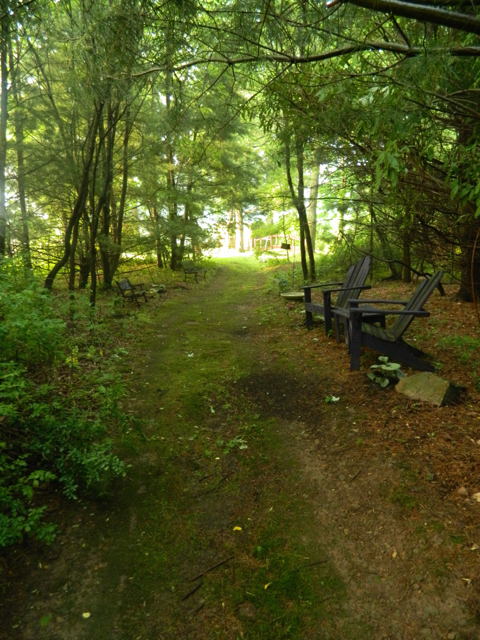 There are phlox, liatris, milkweed and cleome in this area. If you look top-left you can see the horseshoe garden under the flag. Let's go there next. I added a bit of stained glass to the foot of the clematis in the horseshoe garden to hide its bare roots. 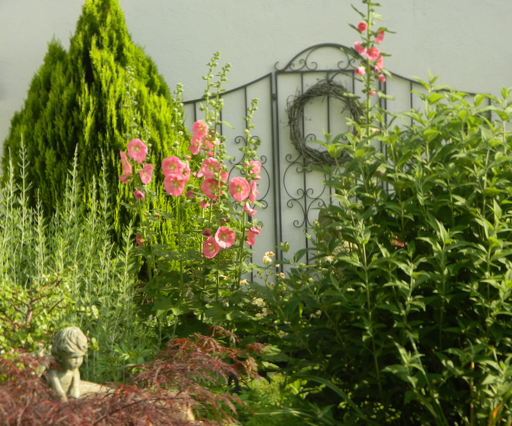 The rose campion is still the star of this garden. 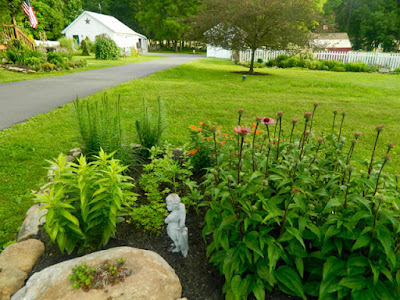 The cottage garden was between blooms: the peonies and roses just finished, with the flower buds of the shasta daisies, phlox and other cottage garden perennials about to burst open. Few blooms, but layers of lush green foliage. Except for the hollyhocks! They stole the show. 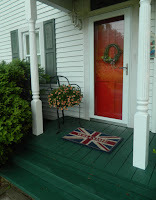 I added a wreath on each door and ivy in a birdcage. Frogs are said to love the rain, but even they were sheltering out of sight. 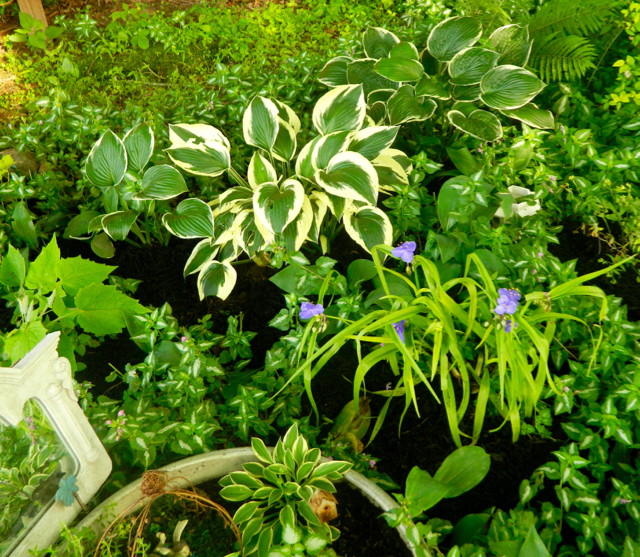 Next, into the shade garden where some of the hosta blooms are about ready to open. 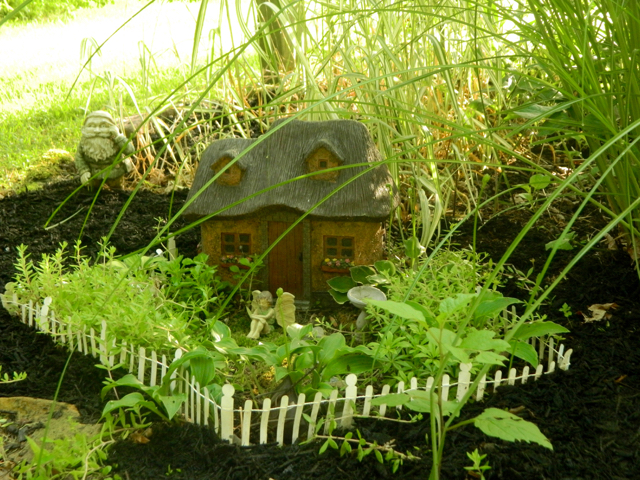 My grandson, Jonathan, spent a couple of days with us prior to the tour date, and weeded and tidied the miniature gardens. Each one is so lovely and special, like Jon. 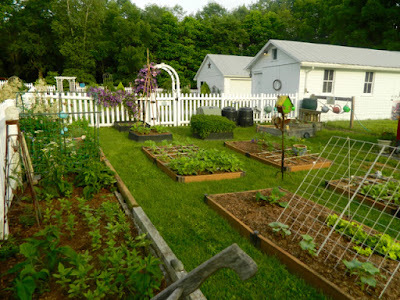 Since this picture, the vegetables have grown in leaps and bounds, due to the rain. We finished making the new, shorter Woodland Walk and H.H. 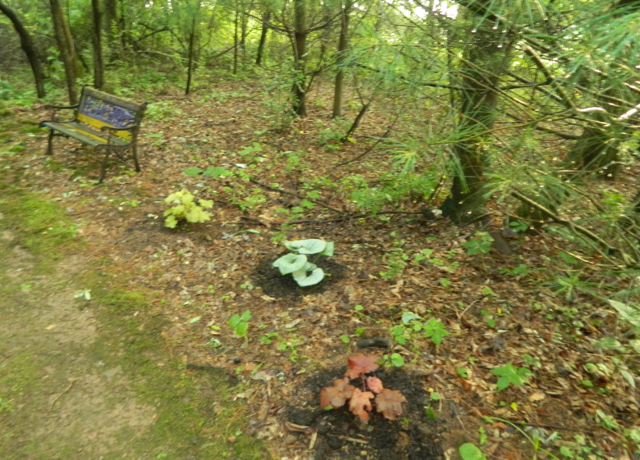 planted shrubs at the entrance. The pathway is along a swale, which is doing its job of collecting rain water and preventing it from flooding our basement. We knew this was a drawback for a 'Walk' but it was the natural path to take. It is a beautiful walk when it is dry. There are pictures in my previous posting. 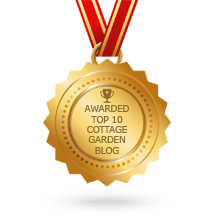 I'm joining Helen at the Patient Gardener's Weblog for her End of Month View. Helen's garden in England is beautiful -- check it out. I was able to give each visitor a private tour, and answer many questions. 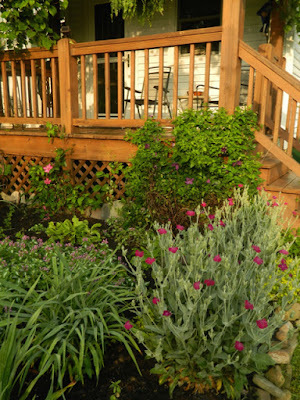 When the rain was light, the garden colors were softer and even more lovely if that is possible. I was overwhelmed with feelings of gratitude for people making the trek through the rain. 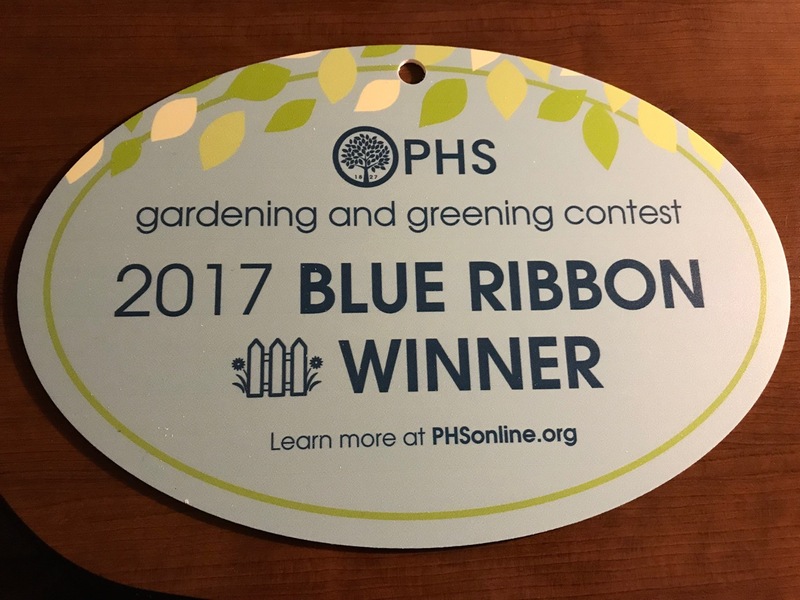 I love showing people my garden, rain or shine. I hope you enjoyed the tour from the comfort of your home. These hot and steamy June days, early morning is the best time to enjoy my garden. 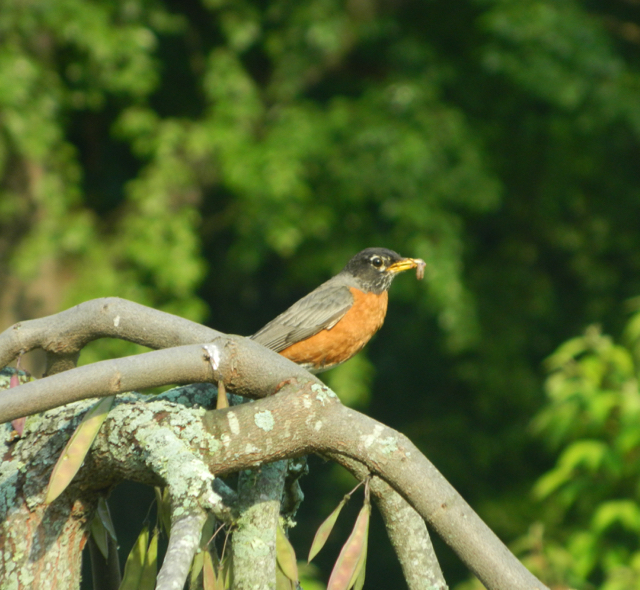 Mr. Robin waits, nervously, atop the weeping redbud for me to pass before feeding his mate sitting on their eggs. 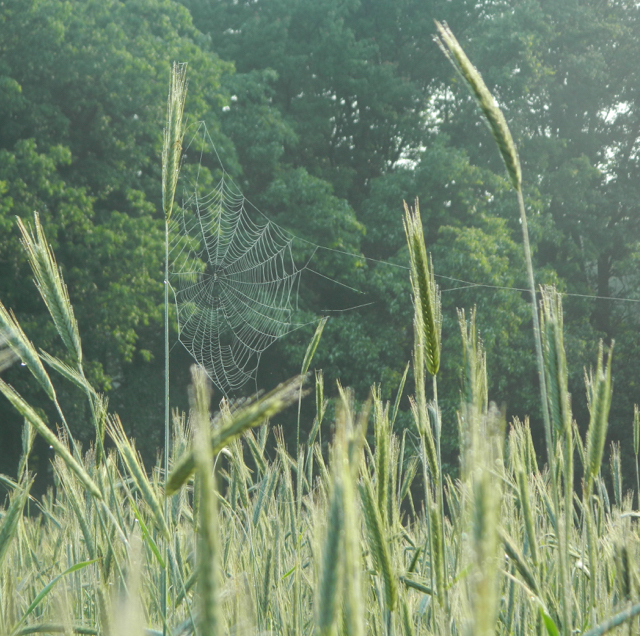 Mist shrouds the bottom field at sunrise, enhancing the beauty of the oats planted there, and defining many spider webs that catch the morning light. I enjoy the peaceful beauty surrounding me and I love the morning chorus of birdsong. I try to begin my gardening chores early, before the heat sets in, with so much to do before the County Garden Tour only a week away. We hoped to be ready by now, but days of torrential rain have hampered our efforts. 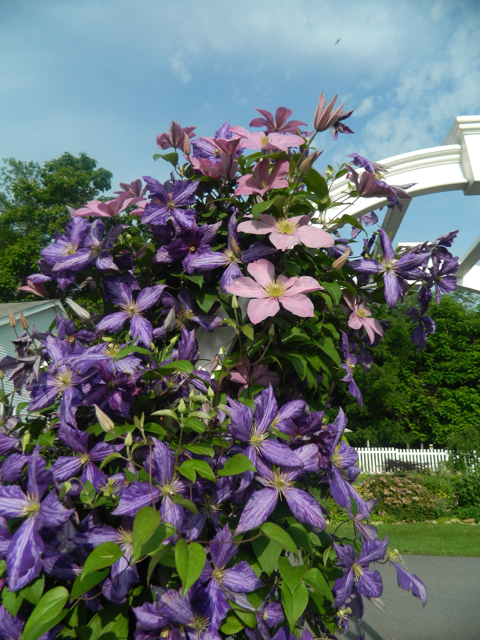 Even with all the problems Mother Nature sends our way, the garden is still looking beautiful. New blooms appear daily, and I can't begin to show them all in this posting, so I will focus on a couple of changes in the garden: a new trug, some different plantings, and the new Woodland Walk. I love to celebrate each season with a gardening gift to myself. With summer a few days away, I treated myself to something very special: a large planting trug for the patio. 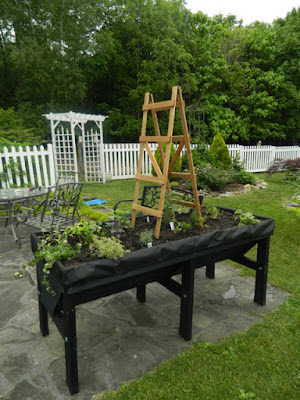 It places herbs and vegetables closer to the back door, and its height eliminates bending and kneeling when gardening. One day, when I can no longer maintain a large kitchen garden, this trug will contain all the vegetables H.H and I need. Isn't it grand? In the middle, I placed a trellis over a tomato plant. A dozen herbs plus flowers such as marigolds and nasturtium. 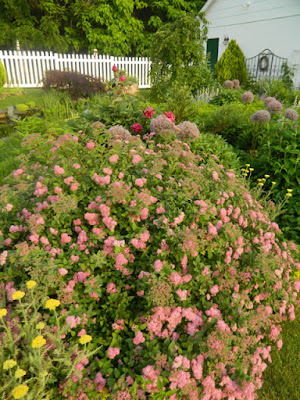 The spirea in the cottage garden took center stage this past week, and in a future post I'll show what's new in this area. Yellow yarrow flanks the spirea. For the first time I planted morning glory to climb two trellises. Actually, I also planted them over the pea tunnel in the kitchen garden, but those seeds may not have germinated, because I soaked them too long while I waited days for the rain to stop. 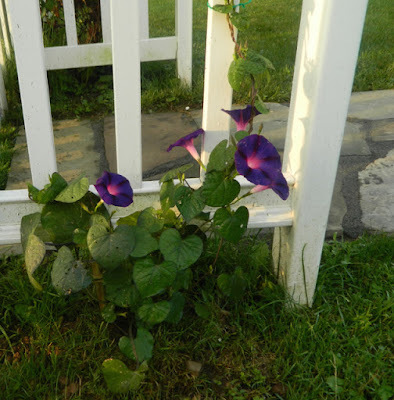 Morning glory on one side of the arbor. 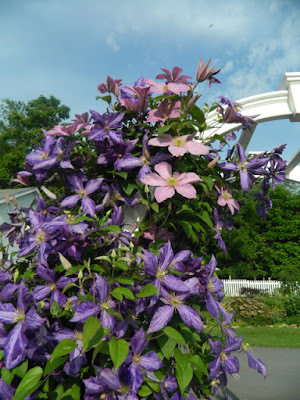 There is a mature clematis on the other side. 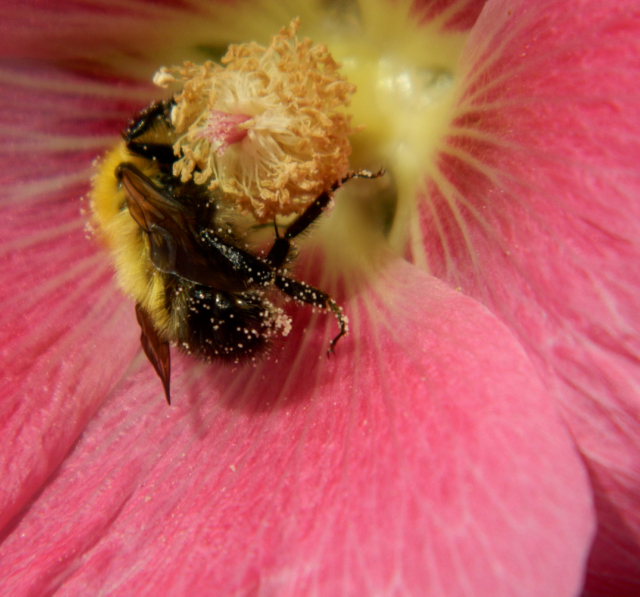 The pea tunnel was the center of a big problem this spring. I planted snow peas to climb over it, lettuce under it, and other cool-weather crops next to it, as I do every spring. Nothing appeared and I puzzled why? I knew there was nothing wrong with the seeds as I used 3-4 packets of different vegetables, all new for 2015. 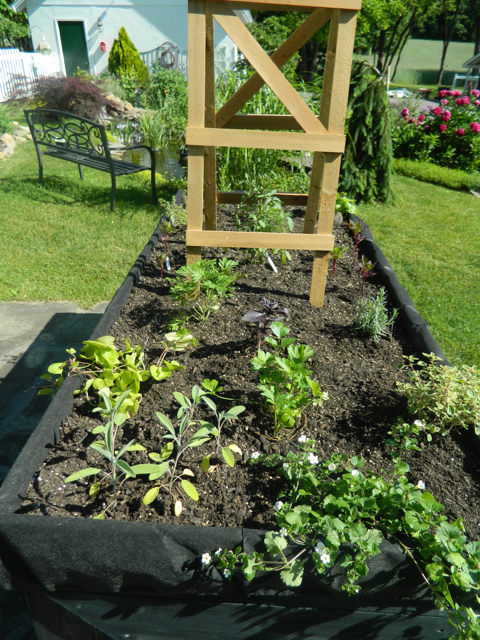 The bed, a raised one, contained my usual mix of compost, peat moss, and top soil. It could only be the soil mix. I knew the compost was very mature, made from kitchen and garden waste and manure from my mini horse, Dude. It could not possibly be too hot. Then a light bulb came on ... We stored Dude's manure in an area under walnut trees ... juglone must have poisoned it. Many plants will not grow under walnut trees because of the juglone their roots emit. I posted about it here. The solution: dear H.H dug all the soil out of the bed and refilled it, this time using mushroom compost with peatmoss and topsoil. 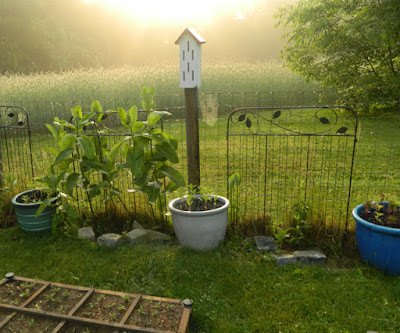 I planted bush beans and sunflowers there. They all germinated and are doing fine! Lesson learned! Moving to the horseshoe garden, which was new last year, the plantings have filled out beautifully. The Sweet William is especially lovely. Snapdragons reseeded themselves all over the bed, and I added some I grew from seed. 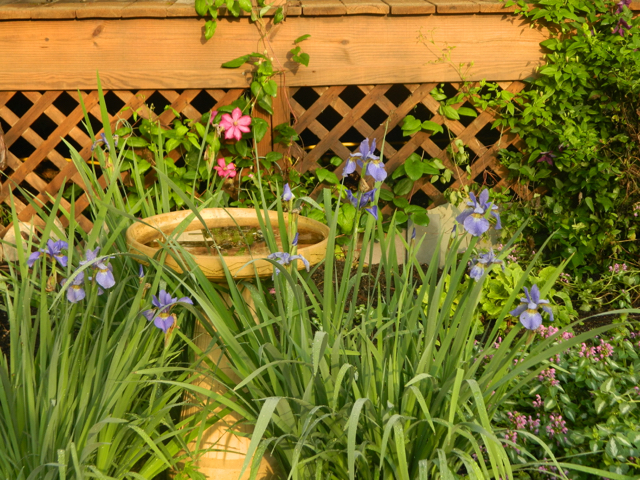 If their blooms are as lovely as last year, they will be quite stunning. 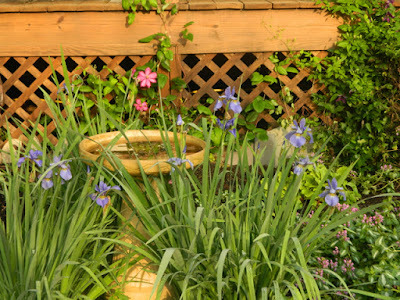 Bearded iris around the birdbath, and clematis climbing the trellis. 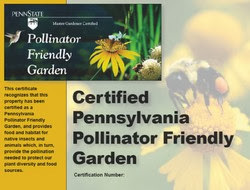 The many native plants in the horseshoe garden attract pollinators and I am reminded this week is Pollinator Week. Native plants in the horseshoe garden include the red rose campion. As planned, we closed the old Woodland Walk which became too big to maintain, plus I'm afraid of the bears we see in there. 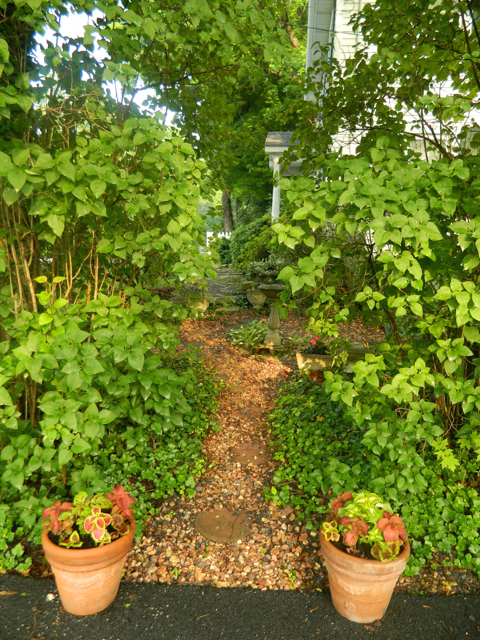 We created a shorter walk and added some shade plants. I am thrilled with the results. The bearded iris in bloom along Bluebell Creek at the entrance to the Woodland Walk. 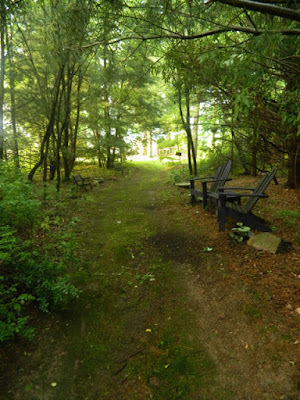 The Woodland Walk is ten degrees cooler than the rest of the garden -- lovely! 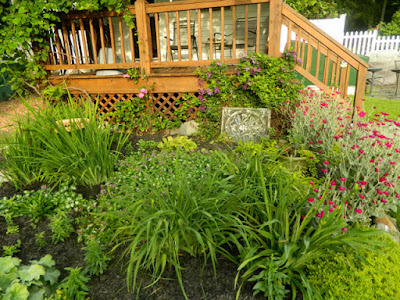 Heuchera and brunnera tend to be avoided by deer. I sprayed them with deer repellent to be safe. 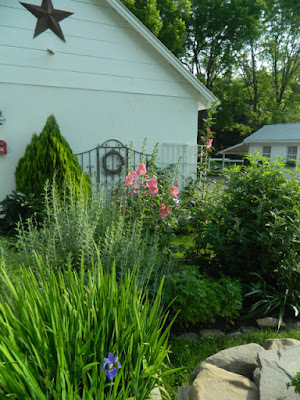 Returning to the main garden, I planted all the containers and window boxes last week. Coleus I grew from seed welcome you to the Stone Garden. 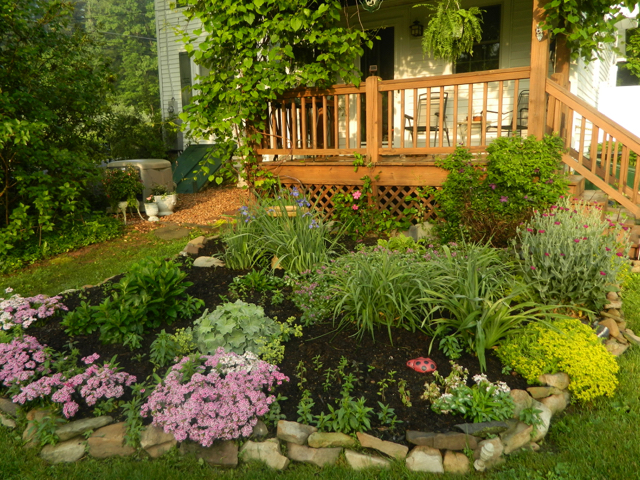 The last chore (a big one) is to finish mulching flower beds, then we should be ready for the BIG TOUR! 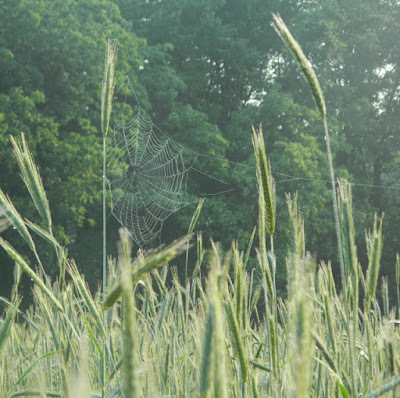 I am linking with Donna at Garden's Eye View for her 'Seasonal Celebrations' meme and with Beth at Plant Postings for her 'Lesson Learned' meme. 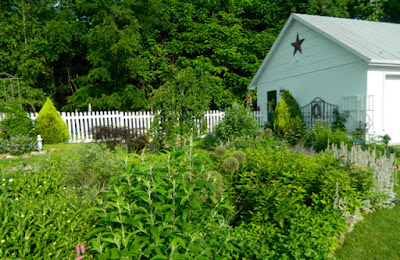 I'm late for 'Garden Bloggers' Bloom Day', but will link to it in case you didn't yet visit Carol at May Dreams Gardens. Thanks, ladies, for three wonderful blogs and for hosting these three special memes. It is a beautiful time of the year ... how are you celebrating your garden on summer's eve? A simple container of calibrachoa at the front door.